Alarm Clock With Highlighter Memo Board Date Time and Temperature Switchable Show 12-Hour or 24-Hour Format Celsius and Fahrenheit Format 3 Groups of Alarm and Snooze Function. - Capable of working in both standalone mode and networking mode. 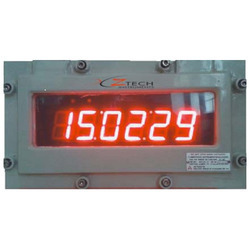 - The whole unit of digital clock is modular, such that any module can be easily remove and a fresh module can be fixed to make the system functional again. - Rectangle large display clock. - Delivery Time : 5 days. Keeping in mind the diverse requirements of our clients, we put forward a broad range of Flip Display Clock.